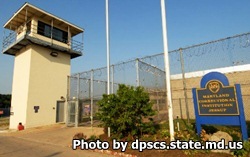 Maryland Correctional Institution Jessup is a medium security prison that houses approximately 1,040 adult males. The average term an offender is housed at Jessup is eight years. This facility has a $38.5 million budget and has a staff size of approximately 330. Inmates can participate in the Maryland Correctional Enterprise program working in a print and graphic arts shop that is responsible for printing most of the state forms and letters. Inmates can earn a GED while incarcerated and take ESL classes. In addition, this prison was designed to cater to those who are deaf or hard of hearing. Vocational courses in a variety of subjects and substance abuse treatments are also available. Visiting for general population inmates is on Mondays, Thursdays, and Fridays from 4pm-9pm (you must arrive by 8pm), and on Saturdays and Sundays from 12pm-8pm (you must arrive by 7pm). Visits are one hour in duration. Disciplinary segregation has visiting Mondays, Thursdays and Fridays from 6pm-9pm (you must arrive by 8pm), and on Saturdays and Sundays from 12pm-8pm (you must arrive by 7pm). Disciplinary segregation offenders may have a single visit each week, all other inmates are allowed eight visits each month. Inmates can have up to three adults and three children per visit.